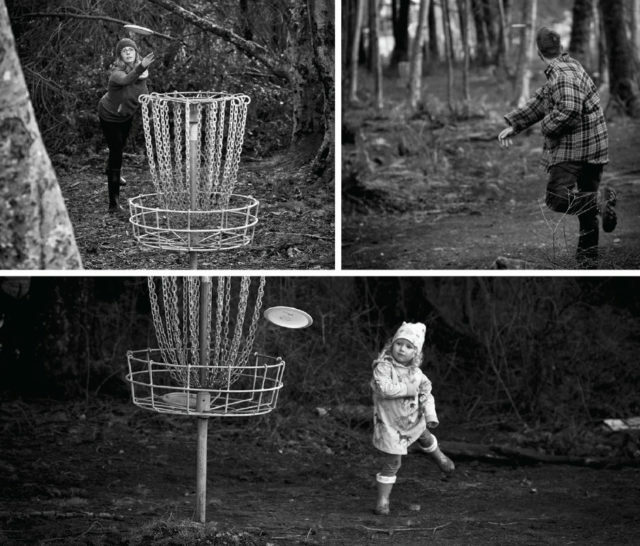 A renegade disc golf course spurs a community to create a forest playground. This story has the feel of a fairy tale. For some it’s been just that, a tale of unrealized dreams. Until now. A few years back a group of Cumberland residents decided to go for a walk in the woods. Not just any walk mind you, a walk with a purpose. Within a few paces things started to click. The location was perfect for their intention. It was an old, overgrown, rocky wasteland, once the site of historic Cumberland Chinatown, surrounded by ancient forest and now owned and governed by the Cumberland Forest Society. And there it was decided; this Cumberland crew would build a trial disc golf course here. The idea was simple: build this thing, see if it worked, and take it from there. 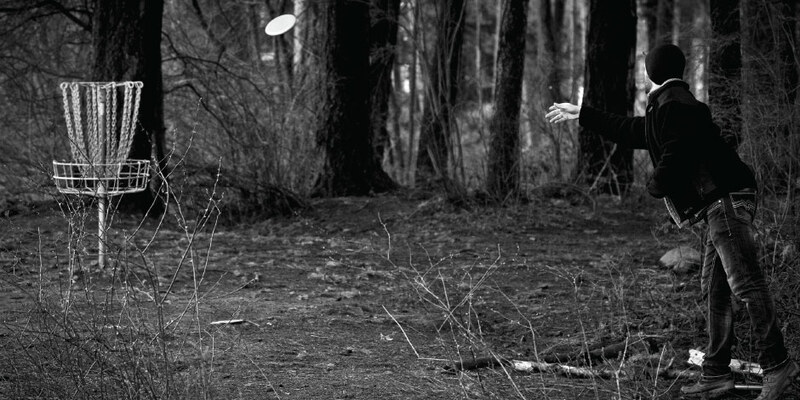 What is disc golf? Governed by the very rules that traditional golfers obey as they try to smack a ball the fewest amount of times while dropping it into 18 holes, disc golfers throw Frisbee-like discs around a course, aiming at targets (baskets) instead of holes. Temporary targets called tonals, which are made of sections of stovepipe, were used. These make a satisfying gong-like sound when you hit them with your disc, evoking similar emotions to holing out a good putt in traditional golf. Unlike traditional golf, there are no expensive green fees, general pretense, or dress code. And that’s the beauty of it. And so, the course was built. Existing trail systems were utilized and tonals were installed on narrow fence posts or hung from tree branches whenever possible. The course was meant to be temporary and removable—the only ecological footprint would be footprints. It was also kept a secret for as long as possible, to allow time for course development before going public. The Cumberland crew joyfully played the course often, making improvements and efforts to minimize its impact on the environment. Then word got out. The course was badass. People started showing up and playing the course. It was time to go legit. A grassroots movement was afoot and there was growing optimism. Cumberland councilors showed great interest, although not all positive. Proposals were drawn up, meetings were held, presentations were, well, presented. In the end, the course’s approval as a sanctioned, Village-approved facility was narrowly voted out and the course was deconstructed and removed. The main sticking point was that the crew hadn’t sought approval from the outset. That could’ve been the end. And for some of those original visionaries and builders, it was. Over the years some stayed connected to the idea and their desire never waned. Councilors came and went, a new Outdoor Recreation Coordinator position was created and filled in the Village, and a few key individuals from the Comox Valley Disc Golf (CVDG) society kept the idea alive. Before the end of 2015, final approval of a new trial disc golf course at the same site was given, and this time proper protocols were followed. The Village of Cumberland, with a new focus on establishing itself as a community with a wide variety of recreational offerings, responded positively. There are more restrictions than the first time around but the sentiment is the same. Free (well, a disc worth $15 is your lifetime membership) recreation for all, and another beautiful reason to spend time in the forest. What that cagey crew of Cumberlanders envisioned when they first created the renegade course is finally coming to life. Their grassroots efforts have been actualized and their actions generated a positive movement toward the overall well-being of a very special village. It also proves that when the right people are connected to a good idea, fairy tales can come true.